Thai Rice Jasmin Rice Sticky Rice. 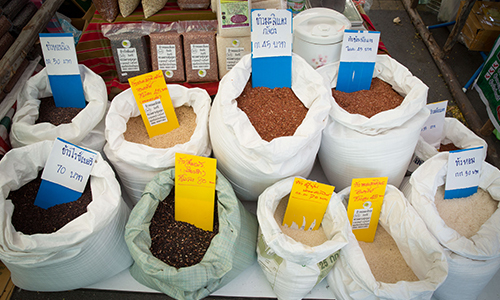 Thailand is a nation where rice is so imbued within everyday conversation that, “have you eaten rice yet?” is a greeting as ubiquitous as a hello. Rice growing dictates the nation’s calendar and is the basis of almost all of the kingdom’s ceremonies, culture and traditions. In Thailand, rice is life and rice is Thainess. Recognising this, the Thai government is hosting a “Thai Rice: Thainess” fair right beside its office with an aim of giving the nation’s farmers a venue to promote their goods in the heart of urban Bangkok, and allowing tourists enjoy a little taste of Thailand’s rural life. Hungry and curious, I went down to take a look. The first thing that struck me was the wonderfully relaxed and fun-filled atmosphere at the fair. Obviously a lot of hardworking people have travelled a long way to sell and promote their wares and for them, the experience is a holiday away from the paddies. They relax, chat, banter with passers-by and encourage them to try their wares. I never knew there were so many ways to enjoy rice. Rice tea was a new one and very refreshing too. But it was also possible to find rice cosmetics, rice ice-cream and a range of other goodies. I treated myself to a plate of sweet rice flakes with coconut shreds – which evoked an old English pudding, in surprisingly pleasing way. It is an educational and entertainment fair as well as a market. There are displays with the facts behind Thailand’s most important industry, and the tools and machinery used in preparation and farming. There’s also a stage where I enjoyed the unique sounds of Thai country music and slapstick comedy. I witnessed a bizarre Thai kickboxing fight between dwarves, which was something I’ve not seen before. The variety of rice and how rice farming differs across the nation is an eye-opener. 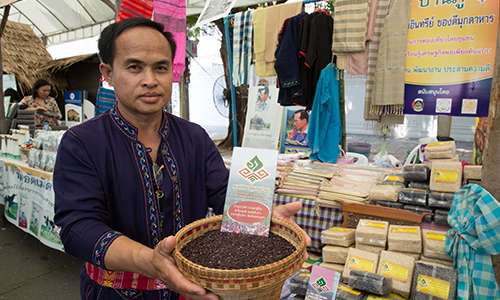 Most of us know and love the kingdom’s famous jasmine rice or sticky rice with their meals and perhaps don’t realise they’re missing out on other offerings; such as, brown rice, polished rice, red rice, cargo rice, broken rice and the trademarked Riceberry – a dark cross-bred rice with antioxidants. Many of these rice strains have amazing health boosting properties and deserve to be better known internationally. At the rice fair, I learned a lot that was new, saw a great deal the interested me, met some genuinely nice people, and gained an appreciation of this product that will enhance every Thai meal I’ll eat from now on. The “Thai Rice: Thainess” event is open daily until 5 April 2015, from 10.00 – 19.00 hrs. For high-resolution images, please click to visit the TAT Newsroom Photo Library: Events & Festivals: Thai Rice Thainess Fair in Bangkok.